Update on July 13th, 2017 - Nathan Mumford passed away shortly after publishing this feature. We will remember Nathan's bright spirit and continue to be inspired by his mission to make a difference and improve the lives of patients battling cancer. Patients like Nathan are north stars guiding our mission and focus on delivering technology that improves patient care and outcomes. Read about Nathan’s amazing story and learn how you can support the Karen E. Mumford Foundation. Originally from Cleveland Heights, Ohio, Nathan is a self-described “3-Peat” cancer survivor, battling Hodgkin's Disease at the age of eight, Acute Myelogenous Leukemia at the age of twenty-four, and colon cancer in 2014. When Nathan was diagnosed in 2004 for the second time, he was given nearly no hope for survival. Remarkably, Nathan’s life was saved by a cord blood stem cell transplant from the cord blood of an African-American baby girl, a perfect match! Sadly, just months after Nathan’s life-saving treatment, his mother, Karen, lost her battle with breast cancer. 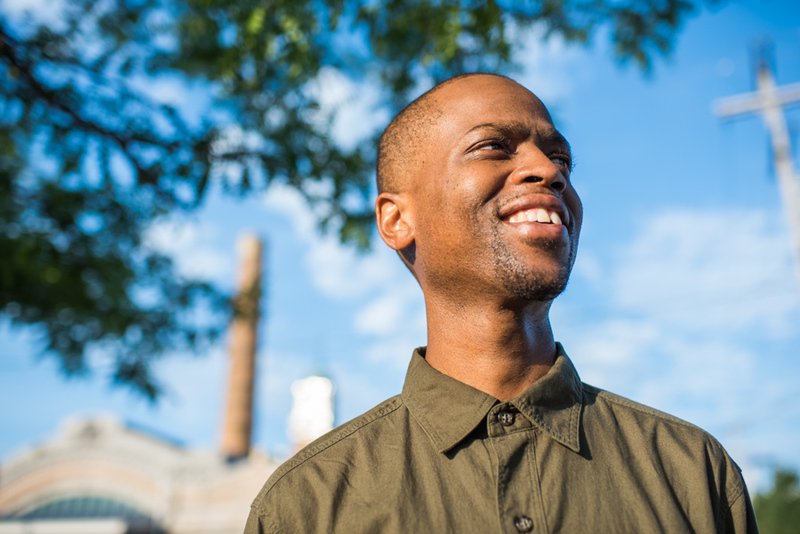 Nathan’s survival of his first two cancer battles and the loss of his mother showed him how important it is for cancer patients to have a support network, which led to the creation of the Karen E. Mumford (KEM) Cancer Foundation. The mission and purpose of the foundation is to honor his mother’s legacy by providing programs and services to improve the lives of cancer patients and their caregivers. The Foundation also seeks to increase awareness of preventative practices that can reduce the chances of acquiring cancer. The "Karen Cares" program, named after Nathan’s mother, provides a day of pampering to lift the spirits of women afflicted with cancer. A day in the Karen Cares program includes limo transportation, a full spa treatment, a photo shoot and dinner where women can connect and support each other. The "Healthy Spaces" program is a collaboration with students from the Virginia Marti College of Art and Design which creates healthy and restorative living spaces for cancer patients from Cleveland Clinic, Metro Hospitals and University Hospitals. The "From the Heart" program, an annual December event, involves KEM volunteers and local athletes who visit pediatric and adolescent cancer patients and bring toys and joy to brighten their holiday season. WILL BE A LIGHT IN THE MIDST OF DARKNESS"
Whether you donate to the KEM foundation directly or support a fundraiser, you become a part of Team KEM and help further its mission of improving the lives of cancer patients. The KEM Foundation’s next fundraiser is Thursday, April 27th at 7-11pm at The Italian Club in Grandview in Columbus, Ohio. 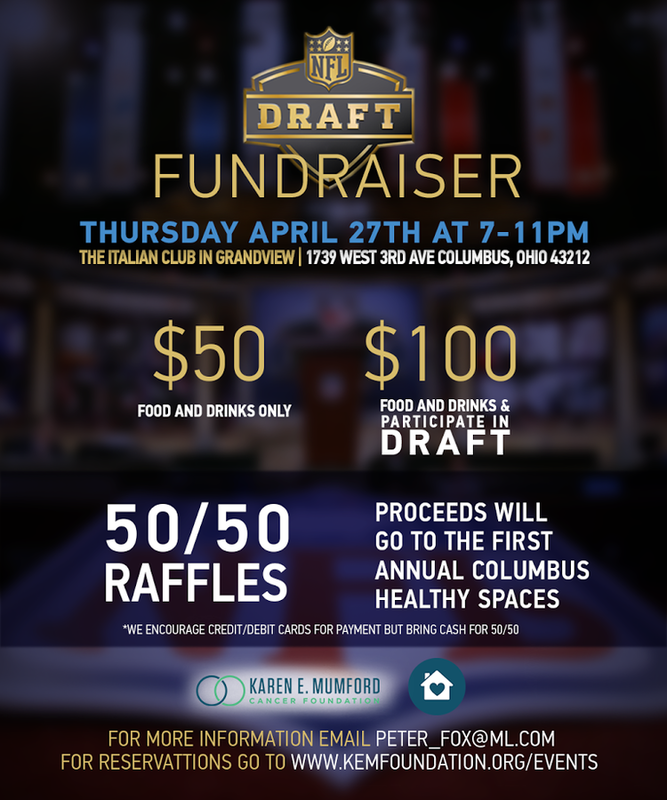 Those in the Columbus area are invited to enjoy a night of fun, food and raffles while watching the NFL DRAFT. Proceeds will support the Columbus Healthy Spaces program.